Bleaching of rhodopsin (Rh) produces a photoactivated methrhodopsin II (R*), which decays through a series of intermediates to opsin and all-trans retinal. 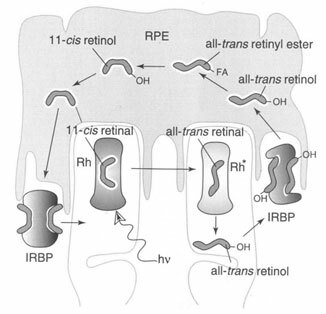 All-trans retinal is reduced within the photoreceptor to all-trans retinol, which is then transported via the interphotoreceptor retinol binding protein (IRBP) through the extracellular space to an adjacent layer of epithelial cells, called the retinal pigment epithelium (RPE). Within the RPE, the all-trans retinal is bound to cellular retinol binding protein (not shown) and then is esterified to fatty acits, mostly palmitic acid. The ester is converted by retinoid isomerase to 11-cis retinol, which is bound to yet another binding protein and oxidized by oxidoreductase to 11-cis retinal. Interphotoreceptor binding protein then returns the 11-cis retinal to the photreceptor, where it recombines with opsin to form dark adapted Rh. Our most recent work has focused on the time course of changes in retinol fluorescence intensity following a large bleach of the visual pigment. The bright field image at top left shows cellular fragments as well as one intact cone (lower left) and one intact red rod (upper right). The cells were suspended in a bath that had been mounted on the stage of the fluorescence microscope. 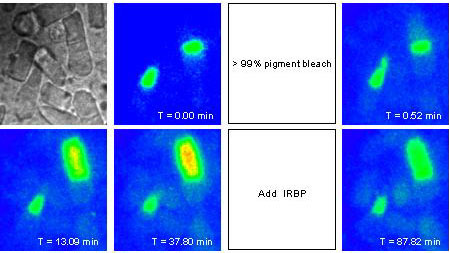 The second field on the top row shows a fluorescence image obtained before visual pigment bleaching (T = 0.00 min). It is apparent that both intact cells exhibit a large amount of fluorescence in their ellipsoid regions. This fluorescence is consistent with the large concentration of mitochondria located there, and likely results from the high concentration of NADH in mitochondria. The cell was then exposed to sufficient bright green (500 nm) light to bleach in excess of 99% of the visual pigment contained in the outer segments of both cells. The top right panel (T = 0.52 min.) shows a large uniform increase in fluorescence in the region of the cone outer segment, and a small amount of fluorescence beginning to appear in the most proximal part of the outer segment of the rod. The bottom panel on the left (T = 13.09 min.) shows that by this time, much of the outer segment fluorescence in the cone had dissipated; however, the fluorescence in the rod outer segment continued to increase, and appeared to uniformly fill the outer segment of the rod. The image in the second panel from the left, bottom row (T = 37.80 min.) shows that the fluorescence in the cone outer segment by this time was very low, but that in the outer segment of the rod had achieved a maximum level. At this time 2 :m bovine IRBP was added to the bath. Thereafter, the fluorescence in the rod outer segment was observed to decline. The last measurement of fluorescence was made 87.82 min following the initial pigment bleach. Cornwall, M.C. and G.L. Fain (1994) Bleached pigment activates transduction in isolated rods of the salamander retina. J. Physiol. 480: 261-279. Cornwall, M.C., H.R. Matthews, R.K. Crouch and G.L. Fain. (1995) Bleached pigment activates phototransduction in salamander cones. J. Gen. Physiol. 106: 543-557. Matthews, H.R., G.L. Fain, and M.C. Cornwall. (1995) Role of cytoplasmic calcium concentration in the bleaching adaptation of salamander cone photoreceptors. J. Physiol. 490: 293-303. Matthews, H.R., M.C. Cornwall, and G.L. Fain. (1996) Persistent activation of transducin by bleached rhodopsin in retinal rods. J. Gen Physiol. 108:557-563. Matthews, H.R., G.L. Fain, and M.C. Cornwall (1996) Role of cytoplasmic calcium concentration in the bleaching adaptation of salamander cone photoreceptors. J. Physiol. 490:293-303. Fain, G.L., H.R. Matthews, and M. C. Cornwall. (1996) Dark adaptation in vertebrate photoreceptors. TINS 19:502-507. Sampath, A.P., H.R. Matthews, M. C. Cornwall, J. Bandarchi, and G.L. Fain. (1999) Light-dependent changes in outer segment free-Ca2+ concentration in salamander cone photoreceptors. J. Gen Physiol. 113:1-11. Kefalov, V.J., M. C. Cornwall, and R.K. Crouch (1999) Occupancy of the chromophore binding site of opsin activates visual transduction in rod photoreceptors. J. Gen. Physiol. 113:491-503. Kefalov VJ, Estevez ME, Kono M, Goletz PW, Crouch RK, Cornwall MC, Yau KW. Breaking the covalent bond–a pigment property that contributes to desensitization in cones. Neuron. 2005 Jun 16; 46 (6) :879-90. PubMed PMID:15953417; PubMed Central PMCID: PMC2885911. Kolesnikov AV, Shukolyukov SA, Cornwall MC, Govardovskii VI. Recombination reaction of rhodopsin in situ studied by photoconversion of “indicator yellow”. Vision Res. 2006 May; 46 (10) :1665-75. PubMed PMID:16153675. Ala-Laurila P, Kolesnikov AV, Crouch RK, Tsina E, Shukolyukov SA, Govardovskii VI, Koutalos Y, Wiggert B, Estevez ME, Cornwall MC. Visual cycle: Dependence of retinol production and removal on photoproduct decay and cell morphology. J Gen Physiol. 2006 Aug; 128 (2) :153-69. PubMed PMID:16847097; PubMed Central PMCID: PMC2151530. He Q, Alexeev D, Estevez ME, McCabe SL, Calvert PD, Ong DE, Cornwall MC, Zimmerman AL, Makino CL. Cyclic nucleotide-gated ion channels in rod photoreceptors are protected from retinoid inhibition. J Gen Physiol. 2006 Oct; 128 (4) :473-85. PubMed PMID:17001087; PubMed Central PMCID: PMC2151575. Estevez ME, Ala-Laurila P, Crouch RK, Cornwall MC. Turning cones off: the role of the 9-methyl group of retinal in red cones. J Gen Physiol. 2006 Dec; 128 (6) :671-85. PubMed PMID:17101818; PubMed Central PMCID: PMC2151603. Cornwall MC, Ala-Laurila P. A perfect marriage: molecular genetics ties the knot with electrophysiology in studies of visual transduction. J Gen Physiol. 2007 Jul; 130 (1) :7-10. PubMed PMID:17591983; PubMed Central PMCID: PMC2154371. Wu Q, Blakeley LR, Cornwall MC, Crouch RK, Wiggert BN, Koutalos Y. Interphotoreceptor retinoid-binding protein is the physiologically relevant carrier that removes retinol from rod photoreceptor outer segments. Biochemistry. 2007 Jul 24; 46 (29) :8669-79. PubMed PMID:17602665; PubMed Central PMCID: PMC2568998. Ala-Laurila P, Donner K, Crouch RK, Cornwall MC. Chromophore switch from 11-cis-dehydroretinal (A2) to 11-cis-retinal (A1) decreases dark noise in salamander red rods. J Physiol. 2007 Nov 15; 585 (Pt 1) :57-74. PubMed PMID:17884920; PubMed Central PMCID: PMC2375465. Dizhoor AM, Woodruff ML, Olshevskaya EV, Cilluffo MC, Cornwall MC, Sieving PA, Fain GL. Night blindness and the mechanism of constitutive signaling of mutant G90D rhodopsin. J Neurosci. 2008 Nov 5; 28 (45) :11662-72. PubMed PMID:18987202; PubMed Central PMCID: PMC2590870. Wang JS, Estevez ME, Cornwall MC, Kefalov VJ. Intra-retinal visual cycle required for rapid and complete cone dark adaptation. Nat Neurosci. 2009 Mar; 12 (3) :295-302. PubMed PMID:19182795; PubMed Central PMCID: PMC2707787. Ala-Laurila P, Cornwall MC, Crouch RK, Kono M. The action of 11-cis-retinol on cone opsins and intact cone photoreceptors. J Biol Chem. 2009 Jun 12; 284 (24) :16492-500. PubMed PMID:19386593; PubMed Central PMCID: PMC2713570. Estevez ME, Kolesnikov AV, Ala-Laurila P, Crouch RK, Govardovskii VI, Cornwall MC. The 9-methyl group of retinal is essential for rapid Meta II decay and phototransduction quenching in red cones. J Gen Physiol. 2009 Aug; 134 (2) :137-50. PubMed PMID:19635855; PubMed Central PMCID: PMC2717693. Miyagishima KJ, Cornwall MC, Sampath AP. Metabolic constraints on the recovery of sensitivity after visual pigment bleaching in retinal rods. J Gen Physiol. 2009 Sep; 134 (3) :165-75. PubMed PMID:19687232; PubMed Central PMCID: PMC2737229. Kefalov VJ, Cornwall MC, Fain GL. Physiological studies of the interaction between opsin and chromophore in rod and cone visual pigments. Methods Mol Biol. 2010; 652:95-114. PubMed PMID:20552424. Koutalos Y, Cornwall MC. Microfluorometric measurement of the formation of all-trans-retinol in the outer segments of single isolated vertebrate photoreceptors. Methods Mol Biol. 2010; 652:129-47. PubMed PMID:20552426.